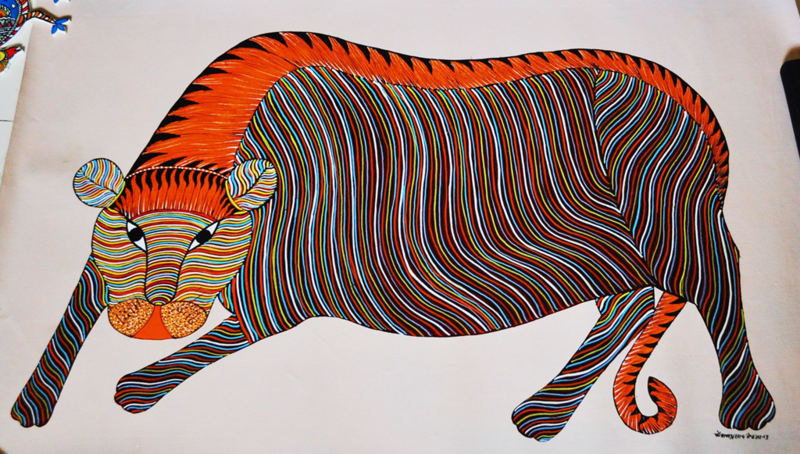 CraftCanvas (India) and Shruti Adelaide are together organizing a Gond Art Exhibition at the Burnside Community Centre at Adelaide from 28 May to 28 June, 2013. On display at the exhibition are different forms of Gond art done by various artists. 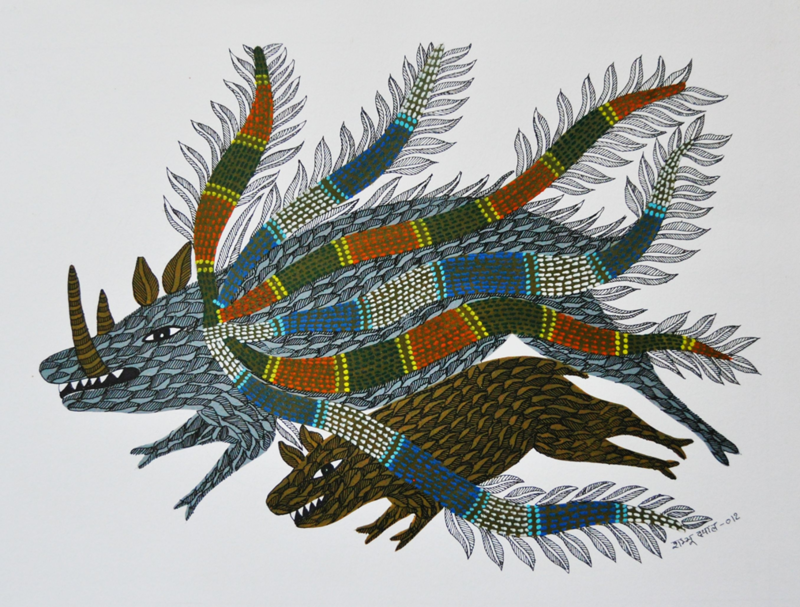 The paintings give an insight into the Gond culture that resonates very strongly with the indigenous art of Australia. The Gond tribes from Central India give their name to Gondwanaland, the land mass that once joined India and Australia at the hip so many millions of years ago. 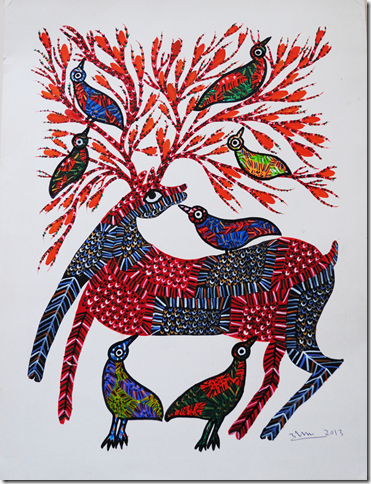 Much like the art of the original inhabitants of Australia, the use of dots play a symbolic role in the Gond visual art tradition. Jangarh Shyam, a master craftsman and exhibiting artist spearheaded the use of dots in the traditional paintings. The Gond visual art tradition originated from the melodic stories of the ‘Pardhans’ who would visit the houses of their ‘yajmaans’ (patrons). Every three years, they would come playing their ‘bana’, the magic fiddle, and singing in praise of ‘Bada Dev’, the most important Gond deity. The Pardhans are an inextricable part of Gond society. They are a visible presence throughout the Gond people’s lives and death and perform the requisite ceremonies. The Pardhan people originally painted on the walls of their huts and many still continue to do so. On these walls they paint murals of the co-existing natural environment. Their paintings reflect their beliefs and their way of life. A deeply nature loving community, they worship various aspects of nature with interesting rituals and ceremonies. Like indigenous Australian art, Gond art is furnished with colours prepared from the flora and earth in the artists’ natural surrounds, red from the palash flowers, green from som leaves, yellow and deep red from crushing stone, with the brush being made form bamboo threads. The paintings of the Gonds are colourful, mesmerising, and full of an animal intensity and vitality. Thanks so much for posting the details. Looking forward to a great turnout!